I was in my early teens when the 1973 Yom Kippur War/October war took place, and have been interested in Arab Israeli wars ever since. At that time I also had a large number of 1/300 NATO/Warpac units, and gamed in this scale more than any other. Having bought the Cold War Commander rules at the Alunwell show in 2008 I started to plan out my forces in for this area, a Bar Lev line fort seemed the obvious place to start. Planning on ahead a SAM2 site on a CD and some sand banks for the Egyptian combat engineers to attack with their high pressure water hoses will also make it onto the list of projects for this area. The pictures are WIP's I still need to put barbed wire around the fort and build a watch tower and put some radio antenna on the command building. The four bunkers are all 1p coin size to take my HMG and mortar stands. The sand bags area made from Miliput shaped with a scalpel blade. The main ground work was made from foam core board, cut to shape and them smoothed over with polyfiler to cover the joins, and PVA'd with sand when the filler had dryed out. The command building was made from Foam core and card off cuts. I made this fort late last year, before Osprey published their book on Israeli Fortifications of the October War. So my fort is not based on any historically accurate information. 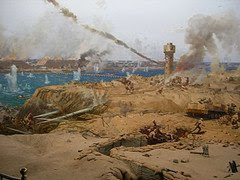 If you do a search on flickr for October war you should be able to find some pictures from the 360 panorama painting of the Egyptian crossing of the suez canal from a museum just outside Ciro.